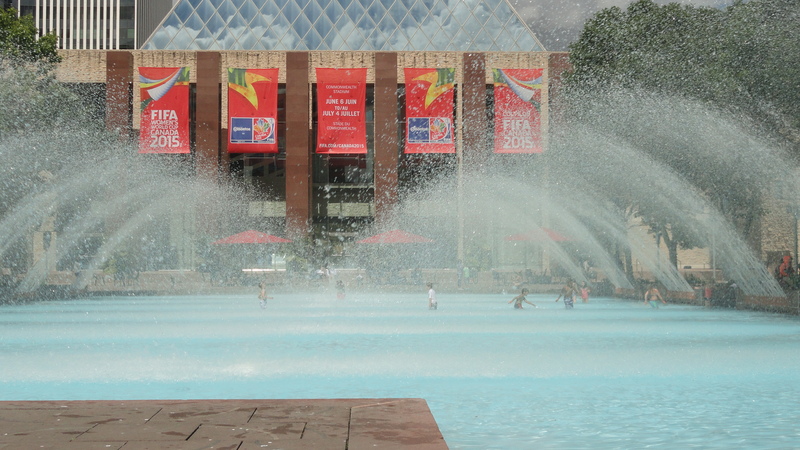 Keeping cool in Edmonton’s hot summer means a trip to the Legislature’s fountains for some families. The guidelines were simple enough: find a destination within a 24 hour train ride that didn’t involve many transfers, somewhere safe, warm and relatively cheap. After eliminating San Francisco (Comfort Inn $350USD/night), and Eugene (three transfers) my friend Signy and I narrowed down the choices to Edmonton. But did Edmonton have any kind of cool factor, something you could brag about on Facebook? Apparently not, as many friends thought we were being sent to Edmonton as a punishment of some kind. Even Edmontonians were surprised that Edmonton was our destination, rather than just a layover. Via Rail offers a spectacular and affordable service through the Rockies into Edmonton. Departing Vancouver early Sunday evening, the view along the Fraser River was so different than the one from a car window. Close to the water, we chugged through suburbs and industrial parks where the tracks lay hidden. Our beds for the night were a couple of upper bunks, with more than enough room to spread out and thick privacy curtains. Our “Sleeper Plus” fare included three meals in the dining car, and each meal was a treat. Booking the last sitting for each meal meant we had extra time to enjoy the food and take in the scenery. The dome car had seats available most of the day, making it easier to spot the moose and the Big Horn sheep alongside the tracks. We also had an hour to explore Jasper while other passengers unloaded for their visit to the Rockies. Jasper tourism didn’t seem to take advantage of our layover – short term bike rentals, a quick taxi tour or a guided walk would have helped make the most of our time in Jasper. Instead we wandered around, admiring the Fifties architecture of the shops and wondering about the history of the town. 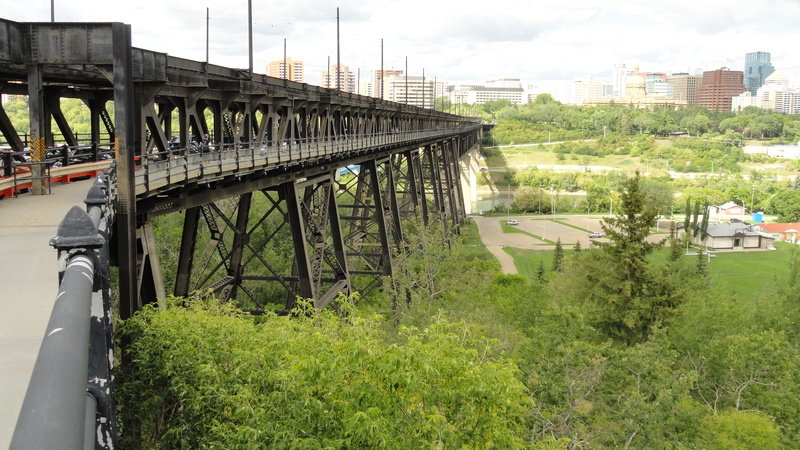 Edmonton’s High Level Bridge offers a great perspective of the city. After 27 wonderful hours on Via Rail from Vancouver, Edmonton was the perfect summer destination. We stayed in Old Strathcona – south of downtown across the North Saskatchewan River – which certainly amped up the cool factor. Bearded and bespectacled gentlemen serving coffee and selling used books convinced us that we had hit Edmonton’s hipster ‘hood. With an original Army and Navy department store and few chain stores, Whyte Avenue had plenty of shops to browse for locals and tourists escaping the heat. An hour spent at the Wee Book Inn meant my hand luggage was overweight on the return flight! Walking across the High Level Bridge gave us a great perspective of the city. The Legislature Building sits beautifully surrounded by 56 acres of manicured trees, lawns and gardens. A free tour of the “Ledge” provided great anecdotes from Alberta’s history, but the origins of the palm trees growing in the main dome of the building remain a mystery! 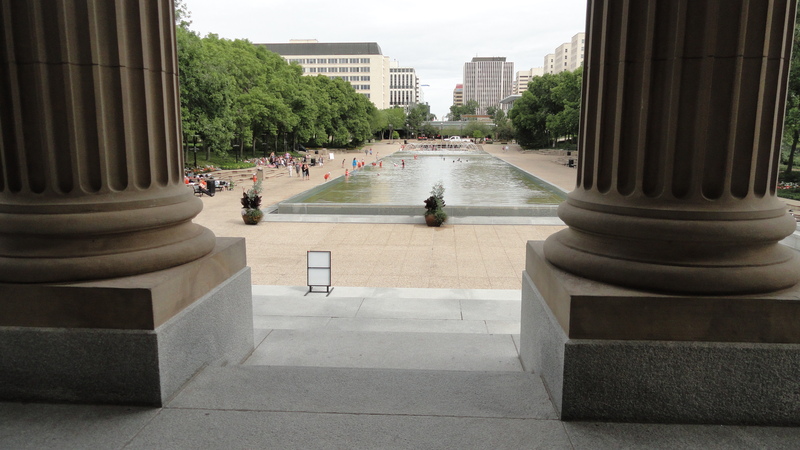 Most impressive was the mirror pool in front of the Legislative Building. Coming from drought ridden BC it was surprising to see kids swimming in the fountains in front of the Government buildings. Not just one or two families letting their kids cool their feet in the pool, but rather whole groups of summer campers enjoying a dip and spraying water guns to boost the fun factor. Everywhere we went in Edmonton locals were swimming in fountains and making the most of summer in the city. Serenity now at the Mirror Pond outside the Alberta ‘Ledge’. Teaching Canadian history was my excuse for dragging Signy to Fort Edmonton. Once located in view of the Legislature Building and downtown Edmonton, many of the buildings were reconstructed further down the South bank of the North Saskatchewan River. Fort Edmonton now houses a replica HBC fur trading fort circa 1846, as well as three community streets from Edmonton’s past: 1885 Street, 1905 Street, and 1920 Street. Costumed performers and staff are found in many of the buildings and happily answer questions and share stories from Edmonton’s history. If taking Via Rail from BC wasn’t enough to quench our thirst for rail travel, a steam train transports visitors around Fort Edmonton. It could’ve felt a little hokey, but the Fort did a great job in providing visual insights of how Europeans settled into Canada’s wilderness. Despite being known as “Festival City” Signy and I managed to hit Edmonton in the one week of summer without a festival. But we found some local musical talent in El Cortez Mexican Kitchen and Tequila Bar, and a John A. Macdonald doppelganger in the Confederation Lounge of the Fairmont Macdonald. Chasing instagram suggestions led us to The Common, a lounge with an attitude. Featuring DJs, locally sourced food and a dance floor, The Common felt like we found Edmonton’s edge, where suits mix with denim. Travelling with Via Rail allowed us four nights in Edmonton, before The Canadian made its way back from Toronto to Vancouver. Checking in with Via Rail the night before our return trip we found our departure was to be delayed between 12 – 16 hours, a day more than our budget allowed. So after an hour and thirteen minutes in the air and over 1,100km of train track below us, we returned to Vancouver, already missing Edmonton’s joie de vivre. For all matters tourism, visit Explore Edmonton. For the latest train details and deals, visit Via Rail. 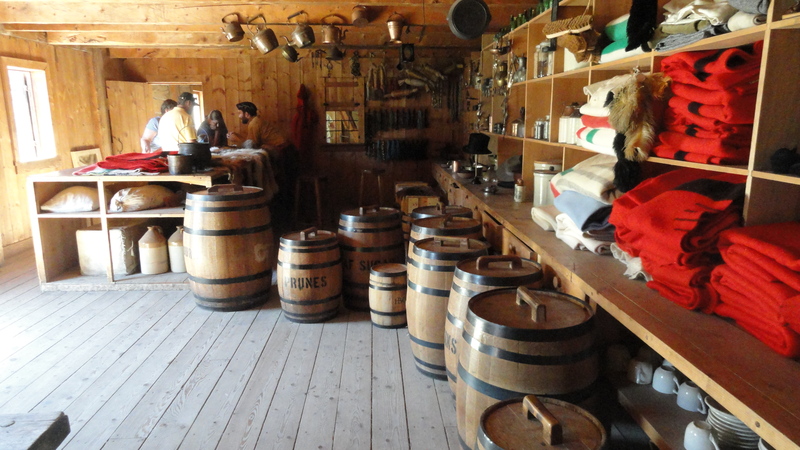 For a trip back in time, visit Fort Edmonton. 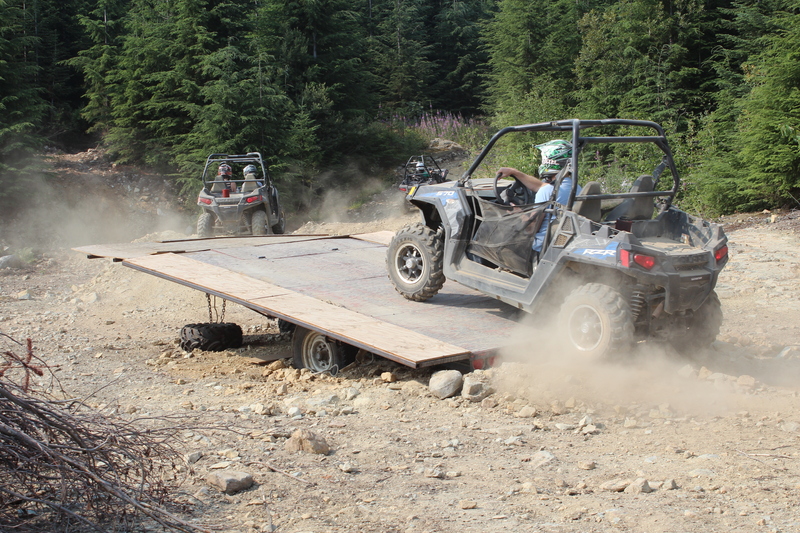 The Polaris 570 cc RZR has never met an obstacle it didn’t like. Close to the highest point of Fairmont Chateau Whistler Golf Course, the Blackcomb River dissects the manicured greenery and drops the air temperature about 15 degrees. The water’s arrived directly from the Horstman Glacier atop Blackcomb peak, which explains the cold and why this is a popular spot during record-breaking heat. “It’s like instant air conditioning,” says a friend. It also makes the mosquitoes disappear, I think to myself. 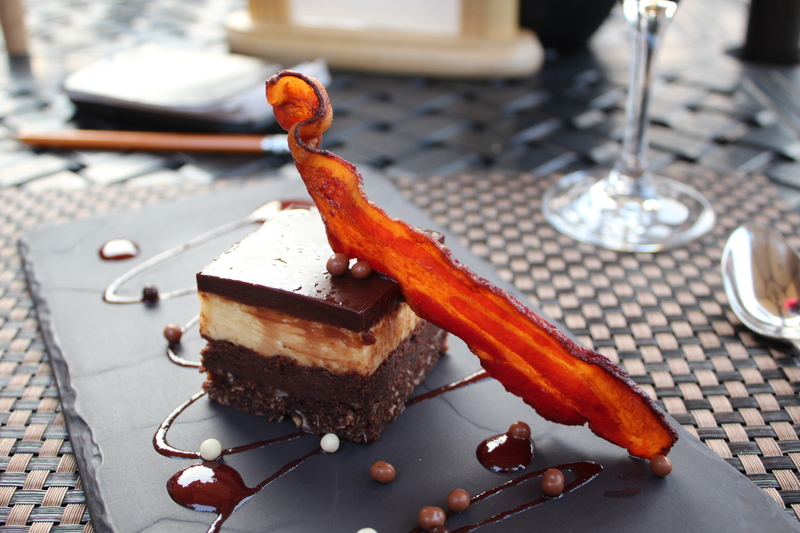 At the clubhouse, we’d just finished an indulgent meal, which somehow featured bacon in every course, including the caesar aperitif and the Nanaimo bar dessert. The temperature is still in the 20s and haze from the Pemberton forest fire lingers. If you like your adventure on the mild side, the Golf Clubhouse Dinner and Nature Tour is right up your fairway. Enjoy dinner as the sun sets behind Rainbow Mountain, then board a golf cart for a nature tour of the course. The carts are equipped with GPS, which seems like overkill to me, (how hard can it be to navigate 18 numbered holes?) but given the 400-foot climb in places, I’m happy not to be walking. The Fairmont’s Golf Clubhouse Dinner and Nature Tour covers several food groups, especially bacon. Even for non-golfers like me, there’s much to enjoy about the tour, which traverses creeks and milky-green glacier-fed ponds, ancient Douglas Fir, and granite bluffs. Sadly, the bears aren’t out tonight, but a protective mother grouse is strutting around the 13th hole with her three chicks in tow. The course has erected bat houses close to the 18th green, with more in mind than just encouraging wildlife. A single brown bat eats up to 1,000 mosquitoes in an hour! If you like your adventure in something more agile than a golf cart, a RZR (that’s “Razor” when you say it out loud) Tour will safely push you a little further beyond your comfort zone. RZRs are four-wheeled, off-road vehicles capable of negotiating the gnarliest of boulder-strewn logging roads and creek beds. The morning after our night at the golf course, we rise early at the Fairmont Chateau Whistler for a RZR Alpine Sunrise Tour by The Adventure Group (TAG). 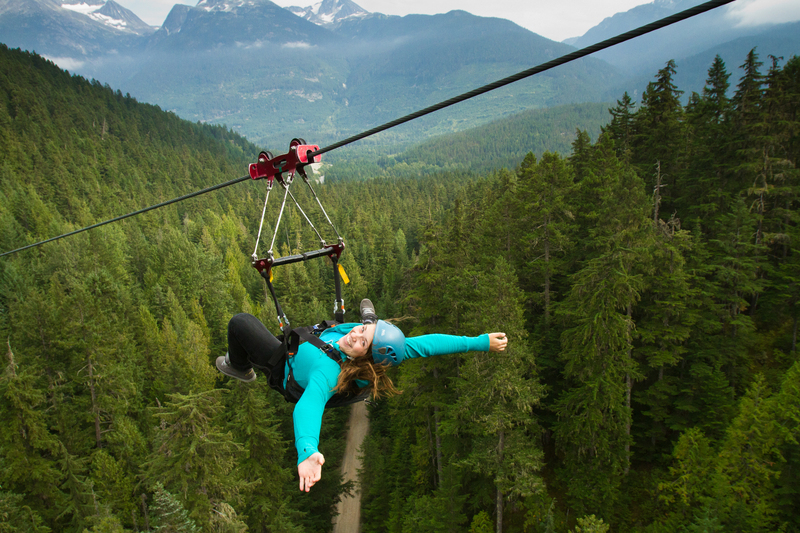 Alongside its ever popular Superfly Ziplines at Cougar Mountain, about 10 minutes’ drive from Whistler, TAG’s RZR tours are an exhilarating way to quickly find yourself in the rarefied air, high up in Whistler’s backcountry. With a guide driver at the front and ‘spotter’ at the back, we each board a Polaris 570 cc RZR and make final adjustments to dust masks, goggles and helmets. With no rain for weeks, and exposed to the elements but for a roll cage, we’re about to get extremely dusty. And as I turn the ignition key sparking the engine to life, I can’t help thinking a GPS would be better suited to a RZR than a golf cart. For the ultimate in thrill rides, Superfly Ziplines are hard to beat. It’s a bumpy ride – extremely bumpy in places – but with one foot firmly applied to the gas, the RZR is capable of clearing anything in its path. The bucket seats absorb most of the jolts and on the steep bits, the brakes respond better to a few taps than to sustained pressure. Our tour takes us through Ancient Cedars and Showh Lakes, hiking areas known for giant trees and good fishing. Lupins and fireweed are everywhere at about 3,500 feet, where we park to admire hazy views of Mount Currie and the Soo River below. It’s a world away from the bustle of Whistler village, and I begin to think of how much fun it would be to ride a snowmobile up here. Back on this tour, there’s more fun to be had at an obstacle course created in a clearing that features a teeter totter, berms, and steep embankment trails for those who hold their nerve. During the 15-kilometer, two-and-a-half tour, we rarely exceed 25 km/h, such is the heavy going on Cougar Mountain’s rocky roads. But bouncing around on trails all but impassable to any other vehicle is half the fun. For anyone with $11,000 to spend and a quiet air strip, RZRs can accelerate from 0 to 35 mph in four seconds, and clock over 80 mph! For similar speeds at less money, you might want to check out the Superfly Ziplines. Fairmont’s Golf Clubhouse Dinner and Nature Tour includes a three-course dinner and costs $69 per adult ($35 per child) and is available Mondays, Tuesdays, and Wednesdays. Call 604 938-8000. Developer Abbot Kinney built the canals of Little Venice in 1905. A few of the canals survive today and restoration work in the 90s made Little Venice one of L.A.’s most desirable neighbourhoods. At the corner of Cynthia Street and North Doheny Drive in Los Angeles stands a bland-looking triplex. With so much architectural extravagance across the road in Beverly Hills, the gated compound at 882 North Doheny is on the West Hollywood side of the street and barely warrants a second look. Until Erick Martinez tells us to take a second look. We dismount our bikes and catch our breath. We’ve been following our guide, Erick, mostly uphill from Bikes and Hikes L.A.’s store on Santa Monica Boulevard. The Judd family is still catching its collective breath. “James Dean?” I offer between gasps. “Bette Davis?” guesses my wife, Leah. “None other than Marilyn Monroe lived here,” says Erick. Turns out she wasn’t the only famous resident because Frank Sinatra lived next door. Today, the building is on the market for $4.2 million, a modest amount compared to the Carolwood Estate up the road in Holmby Hills. Once owned by Walt Disney, it’s now selling for $92 million. 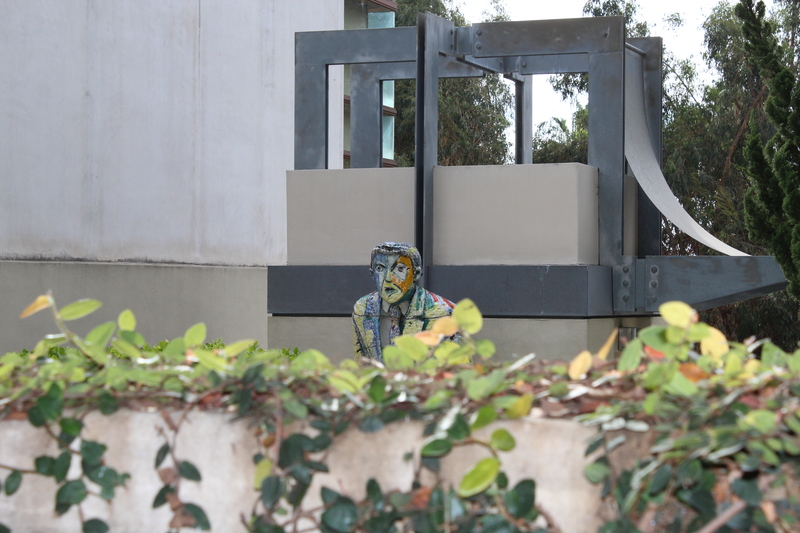 Bel Air residents don’t get angry at intruders, their sculptures do. On a 32-mile (51 kilometres) bicycle tour of Los Angeles, you quickly realize that everything is relative. And everything has a price. Unsurprisingly for a city synonymous with smog and freeways, L.A. is not known for cycling. One magazine has described it as “a pathologically unfriendly bike city”. My friend Lars, a long-time L.A. resident now living in Canada, offered to rent us a car when he heard of our bike plans. He also wondered whether we were crazy. But then getting somewhere wasn’t the point. We were on vacation and with just four full days in the city, we were more interested in the journey rather than the destination. Which in L.A. is just as well: several times during our seven-hour ride, we passed gridlocked motorists. We crossed Sunset Boulevard, stopping briefly to look east at the Whisky a Go Go nightclub, where The Doors, Motley Crüe, and Guns ‘n Roses got their start. A block farther east is the Viper Room, where actor River Phoenix died of drug-induced heart failure in 1993. We cycled west, passing the 31-storey Sierra Towers, where Lindsay Lohan lived for a while after being kicked out of the venerable Chateau Marmont for partying too hard. At least she got out. The Chateau Marmont, built on Sunset Boulevard in 1929, is where actor John Belushi partied even harder and died of a drug overdose in 1982. You don’t have to scratch L.A.’s surface too hard to find its seedy underbelly, which delivers titillating fodder for Erick’s tour. Even the handsome-looking Greystone Mansion – 55 rooms behind a mock Tudor façade, amid 16 acres of exquisitely manicured gardens – has a scandalous past. 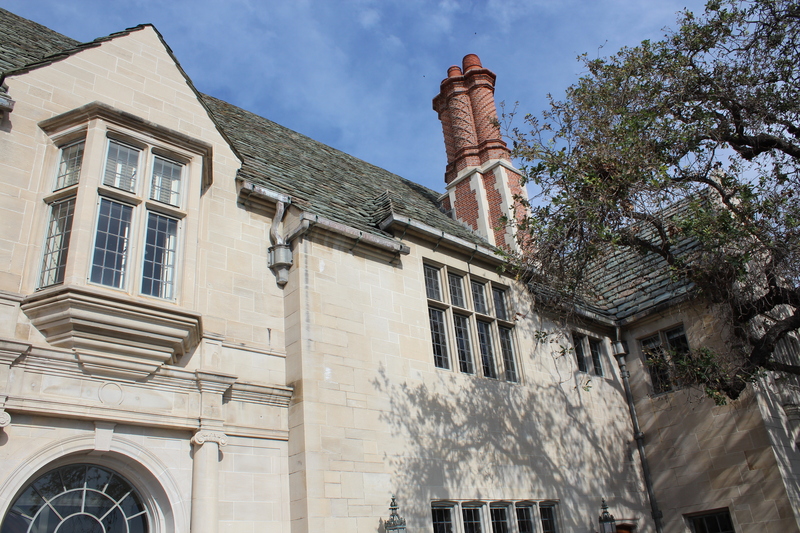 Greystone Mansion – 55 rooms and a murky past. Oil tycoon Edward Doheny paid $3 million to have Greystone built for his son Ned in 1928, making it California’s most expensive home at the time. In 1929, four months after he and his family moved in, Ned died in a murder-suicide with his secretary, Hugh Plunket. There are plenty of theories for the tragedy and Erick knows all of them. More memorable for me though was a different tale about a large spotlight mounted on Greystone’s roof. So concerned with security was Ned’s widow Lucy, she had the spotlight mounted as a means to alert Beverly Hills police down the hill in case of intruders. According to Erick, the spotlight later inspired the Bat-Signal used by the Gotham City Police Department. Today, Greystone is owned by the City of Beverly Hills and is maintained as a park. It’s a glorious place to dismount a bike and wander the grounds, and it’s no surprise to learn that the location appears in dozens of movies, including The Big Lebowski, The Bodyguard, X-Men, and The Social Network. Erick led us west, stopping briefly to look at homes once owned by Tom Cruise, David Beckham and Lucille Ball, who used to personally answer trick or treaters at the door every Halloween. We cycled past the Bel Air Golf Club, where membership hinges on a tidy $2.1-million fee and approval by the board, and then past UCLA, built in 1919. Beverly Hills, Bel Air, Brentwood and Westwood all have their share of climbs, but they are quiet, bike-friendly neighbourhoods. And even back on Santa Monica Boulevard, where we headed west to the coast, a dedicated bike lane made for smooth passage. More hair-raising was cycling the beach path from Santa Monica Pier to Venice Beach (think Stanley Park seawall in summer and directionally challenged pedestrians) where we stopped for a picnic and watched boarders defy gravity in the skateboard park. Inland a few blocks, we lingered at Venice Canals, my favourite part of the tour. 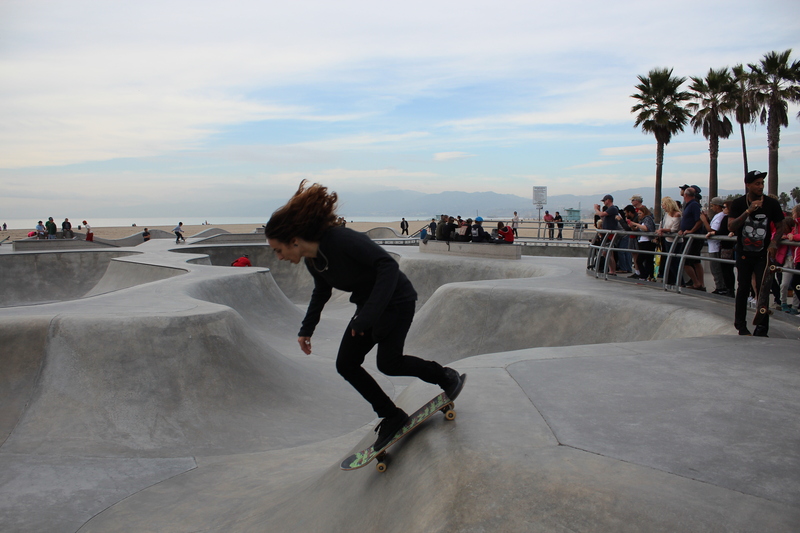 Big hair at the skate park in Venice Beach. To me, the audacity of attempting to recreating Venice, Italy, almost 10,000 kilometres away in Los Angeles, California, epitomizes the American dream at its eccentric best. Developer Abbot Kinney built the canals in 1905, complete with decorative lights, gondoliers and arched bridges. Promoted at the time as “America’s most unique attraction,” Kinney’s vision of a cultural mecca failed to materialize. Amusement parks and freak shows proved more popular with the locals and the advent of the automobile led to most of the canals being filled in to create roads. The canals are a fraction of their former size, but restoration work in the 1990s has since made the neighbourhood one of L.A.’s most desirable. We circled Marina del Rey and its seemingly endless flotillas of yachts and speedboats to Ballona Creek. Now entering the seventh hour of our tour and with the December sun setting behind us, we picked up the pace on the Ballona Creek Bike Path. Like the canals of Venice, much of the Ballona Creek corridor succumbed to concrete in the 1930s, with dire results for the area’s wetlands. What’s left of the estuary has been contested by developers and environmentalists for decades. Oblivious to the numerous ongoing court battles over the area, and in spite of being surrounded by dense development, Ballona Creek still supports a wide array of wildlife, including monarch butterflies, and great horned owls. 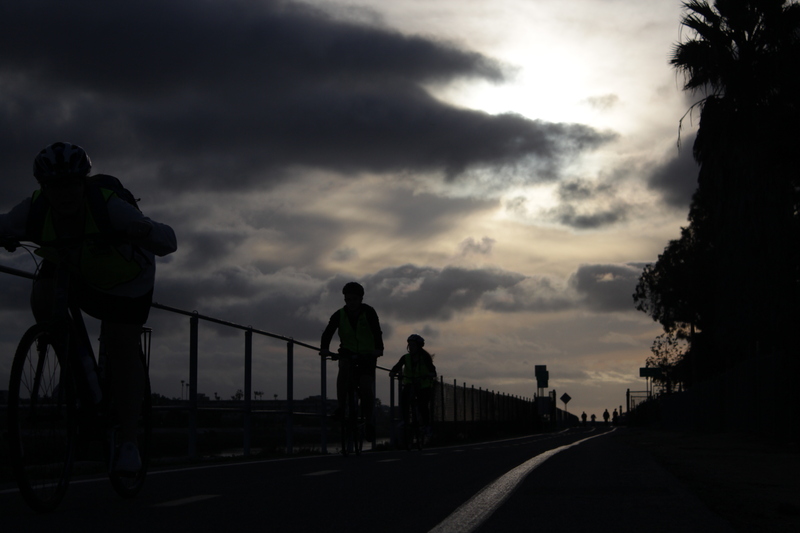 Twilight on the Ballona Creek Bike Path. On our final leg of the tour, the indefatigable Erick continued to supply us with an impressive array of anecdotes. In Culver City we stopped at the Culver Hotel, whose six storeys made it a “skyscraper” in 1924 when it opened. Legend has it that Charlie Chaplin lost ownership of the place to John Wayne in a game of poker, while in 1939, the hotel was the scene of wild parties thrown by The Wizard of Oz cast, most notably, the Munchkins. It was dark by the time we returned our bikes to the Bikes and Hikes outlet on Santa Monica Boulevard in West Hollywood. After nearly seven hours on and off a saddle, I felt tired but elated to have seen and learned so much. I spent weeks in this city during visits as a backpacker in the 1980s. 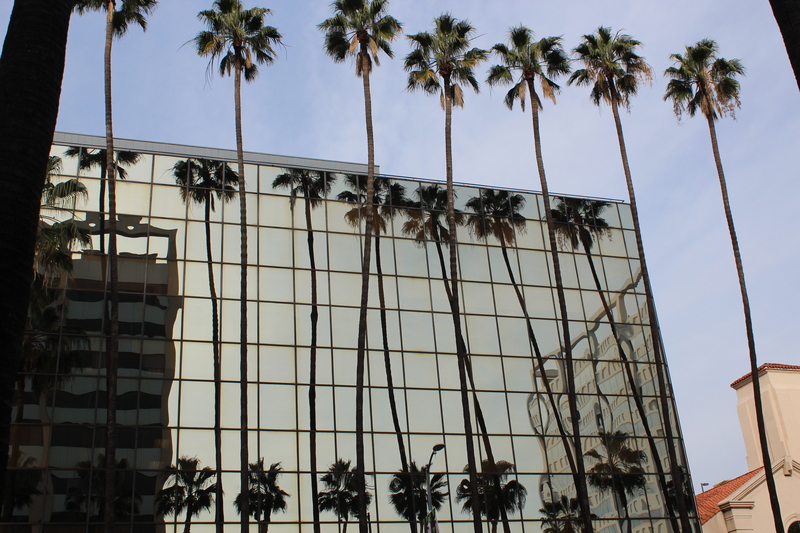 Yet in one day on a bike, I’d discovered more of L.A. than all those trips combined. 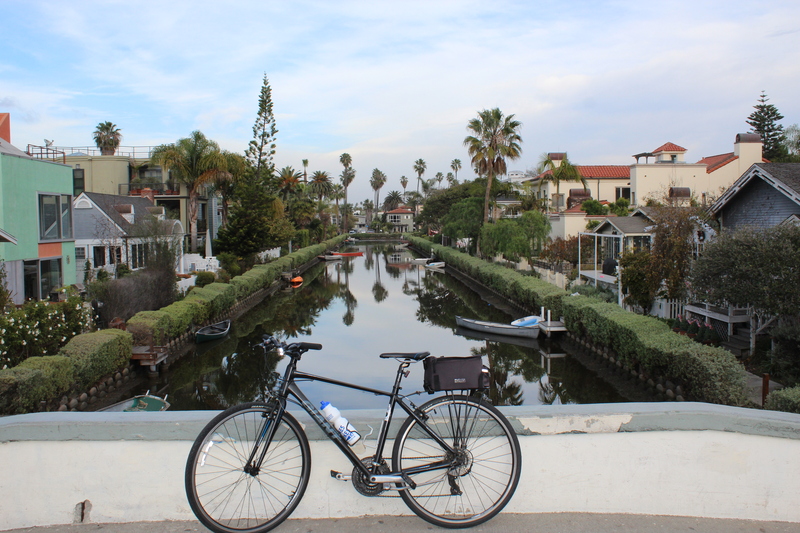 The L.A. in a day bike tour costs $162 per person, covers 32 miles (51 kilometres), and takes about six hours. Visit bikesandhikesla.com for more details.